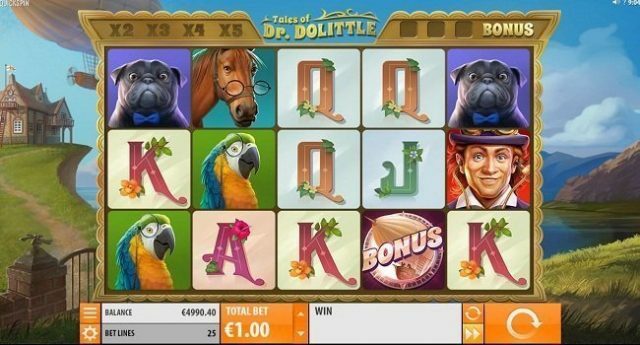 Tales of Dr Dolittle is a Quickspin software based 5 reels and 25 Paylines video slot game which is playable at all devices including mobile phones with coin sizes of 25 p per spin to €£100 per spin. The game has a jackpot of 250 times on your total bet and it contains 3 bonus rounds. 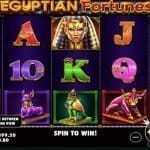 The free spin bonus feature could get you 10 free spins and a multiplier of up to 5x. Tales of Dr Dolittle mobile slot is awesome when it comes to offering bonuses, playing environment as well as background soundtrack. Dr Dolittle’s house is located on top of a hill and you will see a sea in the backdrop of the house. The game has cartoonish symbols such as A, K, Q, J and 10 royals as well as a parrot wearing monocle, a horse with glasses, a pug wearing bow-tie and Dr Dolittle himself. The main character i.e. Dr Dolittle is the highest paying symbols and it offers 2 times on your total stake if you land 5 of these symbols across your payline. 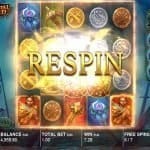 The game has a Respin feature which is triggered when you land winning combination during the base game. The game also comes in a Multiplier Wild feature. During this feature, a win with 1 wild symol in it will give you 2x on your total bet. A win with 2 wilds will get you 3x and a win with 3 wild symbols will reward you 3x of your total bet. Just like these above any win with 4 wilds will give you 4x and 4 wild winning will offer you a multiplier of 5x on your bet. The free spin feature is triggered when you land 3 or more of the scatter symbols across your payline. 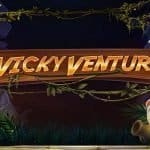 And in that case you would receive 10 free spins.